At Mount Pearl Dental, we offer Invisalign® clear aligners for patients looking to straighten their smiles. 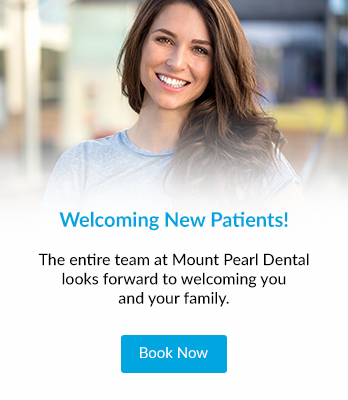 At Mount Pearl Dental, our general dentists provide our patients with effective and personalized treatment plans to achieve a straighter smile. Invisalign® uses a series of aligners that almost no one can tell you’re wearing. They are nearly invisible and removable. You don't have to be afraid to smile during your treatment process. Invisalign® is made with 3D computer imaging technology and has been proven to be effective. Since Invisalign® aligners are virtually invisible, you can maintain a more natural looking smile throughout treatment. Unlike traditional metal braces, you can remove your Invisalign® aligners whenever you wish. You can eat what you want and simply take out the aligners to brush and floss. Patients will receive a sequence of aligners - as few as 12 or as many as 48. You will need to wear each aligner for around two weeks. Gradually, your teeth will begin to move. You will wear the aligners all the time, except for when you are eating, brushing or flossing. A teenager interested in Invisalign for myself. Answers to the questions our dentists are most often asked about Invisalign. Invisalign uses a series of aligners that almost no one can tell you’re wearing. They are nearly invisible and removable. You don't have to be afraid to smile during treatment. Invisalign is made with 3D computer imaging technology and has been proven to be effective. How long will I have to wear the Invisalign aligners? You will receive a sequence of aligners - as few as 12 or as many as 48. You will need to wear each aligner for about two weeks. Gradually, your teeth will begin to move. You will wear the aligners all the time, except for when you are eating, brushing or flossing. The cost for Invisalign can vary depending on the issues you want corrected and your treatment plan. Contact us for a full discussion on costs. Yes! If you have healthy teeth and gums, you might be a candidate for Invisalign. In fact, more adults are choosing to straighten their teeth later in life now that orthodontic treatments like Invisalign is available. Yes! In fact, Invisalign has created a special line of aligners that meet the unique needs of teens, called Invisalign Teen. Invisalign aligners are clear and fit into your lifestyle. Since the aligners are removable, you can eat what you want and by taking out the aligners to brush and floss, you are able to maintain the same level of oral hygiene as previously. As well, if you have a special night out, you can remove your aligners and have a great time! There are less issues around comfort with Invisalign aligners, as there are no metal brackets or wires. As well, you'll spend less time in the doctor's chair. Finally, Invisalign allows you to view your virtual results and treatment plan before you start your treatment. You'll get a preview of how your teeth will look once you've completed your treatment. To find out if Invisalign is right for you, book a consultation with one of our dentists. We will assess your smile and determine the best treatment for you. What is a no obligation consultation? Simply book and appointment with our dentist to see if you're a candidate for Invisalign. That's all! What is a customized treatment plan? We know that everyone's needs are different. Our dentists will customize your plan to meet your unique needs. Our dentists will also provide 1-on-1 information sessions to get all the information YOU need. Do you offer treatment financing? We offer treatment financing options to make Invisalign accessible to everyone. Simply contact our team to learn more. Will wearing Invisalign® aligners affect my speech? Invisalign® aligners may temporarily affect the speech of some people, and you may have a slight lisp for a day or two but not for long. As you get used to having aligners in your mouth, any lisp caused by the aligners should disappear. Invisalign® is an effective treatment option for patients who do not want the fuss with traditional wire braces. Restore chipped or missing teeth with crown and bridge solutions. Our dentists provides extractions for patients with impacted wisdom teeth. Come and visit us for the friendly & relaxed Mount Pearl Dental experience today!